Cancer cells have a very different metabolism from that of normal cells from which they are derived. Their metabolism is elevated, which allows them to sustain higher proliferative rate and resist some cell death signals. This phenomenon, known as the “Warburg effect”, has become the focus of intensive efforts in the discovery of new therapeutic targets and new cancer drugs. Both glycolysis and glutaminolysis pathways are enhanced in cancer cells. 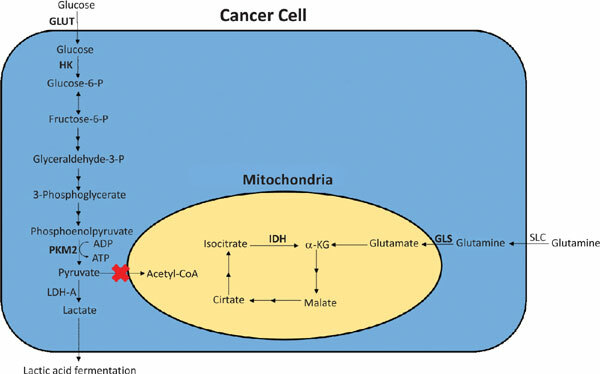 While glycolysis is enhanced to satisfy the increasing energy demand of cancer cells, glutaminolysis is enhanced to provide biosynthetic precursors for cancer cells. It was recently discovered that there is a tyrosine phosphorylation of a specific isoform of pyruvate kinase, the M2 isoform, that is preferentially expressed in all cancer cells, which results in the generation of pyruvate through a unique enzymatic mechanism that is uncoupled from ATP production. Pyruvate produced through this unique enzymatic mechanism is converted primarily into lactic acid, rather than acetyl-CoA for the synthesis of citrate, which would normally then enter the citric acid cycle. Inhibition of key enzymes in glycolysis and glutaminolysis pathways with small molecules has provided a novel but emerging area of cancer research and has been proven effective in slowing the proliferation of cancer cells, with several inhibitors being in clinical trials. This review paper will cover recent advances in the development of chemotherapeutic agents against several metabolic targets for cancer therapy, including glucose transporters, hexokinase, pyruvate kinase M2, glutaminase, and isocitrate dehydrogenase. Cancer, glycolysis, glutaminolysis, hexokinase, glucose transporters, pyruvate kinase M2, glutaminase, isocitrate dehydrogenase.